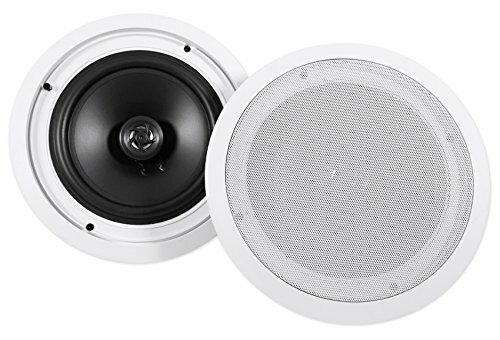 Pair of Rockville HC85 8" White 700 Watt 2-Way In-Ceiling Home Theater Speakers. Peak Power Handling: 350 Watts (per speaker) / 700 Watts (per pair). RMS Power Handling: 120 Watts (per speaker) / 240 Watts (per pair). 8" Woofer. 1" Aluminum Voice Coil. ½" Mylar Dome Tweeter. 20 oz. Ferrite Magnet. High Quality Spring Loaded Push Terminals. Aim-able Swivel Tweeter. Paintable Flush Mount Grills. Frequency Response: 40Hz – 20KHz. Sensitivity: 89dB @ 1w / 1m. Impedance: 8 Ohms. Mounting Depth: 3.03".